Johnny, Jack-O and Jam may be the new additions to Guilty Gear Xrd, but Japanese fans are currently voting to have one more additional character added to the roster. Guilty Gear Xrd -Revelator- is an updated pseudo-sequel to 2014’s Guilty Gear Xrd -SIGN-. Currently available in Japanese arcades, Revelator features a new “Stylish Mode” for beginner players, a new Story Mode, and several adjustments to the UI and core gameplay mechanics. 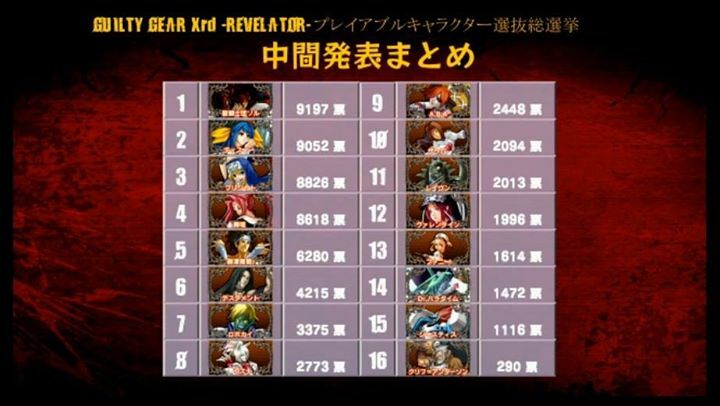 A handful of long-term fans of the franchise criticized Xrd for its comparatively small roster- the previous installment included 25 characters- however Guilty Gear Xrd -Revelator- adds both Johnny and Jam Kuradoberi back into the list, along with the brand new character Jack-O. Guilty Gear Xrd -Revelator- will release for Japanese consoles in Spring 2016; North American and European release windows have not been announced.